As a wedding professional, you want to make sure that your website or blog does the best possible job of speaking for you. Your website is your front lobby and it must act as a virtual receptionist. Many articles discuss web site “optimization” the art of getting your site ranked on the search engines. Equally important is optimizing your site so visitors will take action and either pick up the phone to schedule an appointment with you, or send you an email. Start with a Home Page that is visually appealing and resonates with your bridal audience. Feature photographs that show the spontaneity of the wedding day. They should be the fun, candids of the day. You don’t need a lot – maybe 3 to 5. Include a few carefully chosen words to make the best introductory impression. Focus this statement on them and the emotional benefits they will receive. Also, clearly showing your contact information and the areas you service is very important. Provide some video client testimonials. Offer a bonus gift or information for their first meeting in your “Call To Action” Contact Link. Have an About Us Page that reveals who you are. Create a virtual rapport with your potential client by including a photo of yourself, even better; include a photo of yourself in the act of working with a client. In the brief text, discuss the high quality service you provide and a little history about yourself and your company. Clients are searching for a photographer at this early point in their wedding planning and are looking for someone who they can be comfortable with, someone that can capture the fun and excitement of the day. 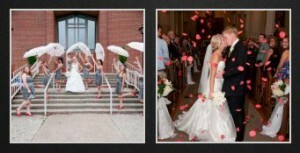 Include testimonials from the bride and groom featured in those photographs. A link to a video snippet interview would be good to use. Let your clients tell their story about how great of a photographer you are and how easy and fun you are to work with. Nothing convinces people to make a decision more than hearing the words of commendation from their fellow peers – people that have been through it before and have been satisfied with the result. Encourage a get together with both the bride and groom at a time that’s convenient for them. Let them know that this is a meeting to help all of you get to know each other better. Let them also know that you have several resources that they are welcomed to and could really facilitate their planning needs and you’re happy to share those resources with them at that first meeting. The point we’re trying to make here is this. The first contact with today’s wedding client should never be about you – it should always be about them. Once a client feels that they are important to you as a person and not just another booking the door is opened to talk about yourself, your passion for your art, and how much you’ll enjoy working with them. Also, showing fun, spontaneous photographs will speak to their heart and soul because that’s exactly what they’re looking for in their wedding photography. And, your customer testimonials will help seal the deal on getting them to come in and talk with you. In the wedding industry, every year is a rebirth. You cannot rest on the laurels of satisfying customers and hoping for referrals. Even when someone recommends your company to another engaged couple, if your website and blog are not up to par, you can turn them off before you even have the chance to meet them. In this day of technology and online communication, it is vital that your website not only does your talking for you, but also makes you look good, and allows your prospective client to connect with you in as easy a manner as is possible. This entry was posted in Photo Marketing Tip and tagged Optimizing Website, Photography Website, Professional Photography, Wedding Photography by StevePPI. Bookmark the permalink.